March 1, 1989 -- These days getting cash from credit-card machines costs cash. 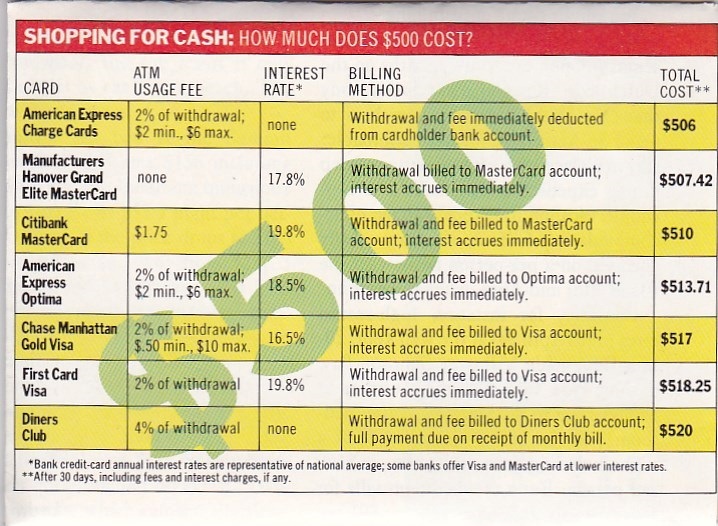 As the accompanying chart reveals, it can set you back as much as $20 to withdraw $500 from an automated teller machine. One oh-so-slender silver lining is that an increasing number of banks are joining cash-machine networks like Plus and Cirrus. This allows travelers to use their bank cash cards to withdraw cash from their checking or savings accounts instead of borrowing against credit lines. Current fees for such cash transactions vary but are usually less than $1 per withdrawal, making them one of the least expensive ways to get cash on the road.